View of Ginevan Cemetery from lane branching off of Ginevan Road. 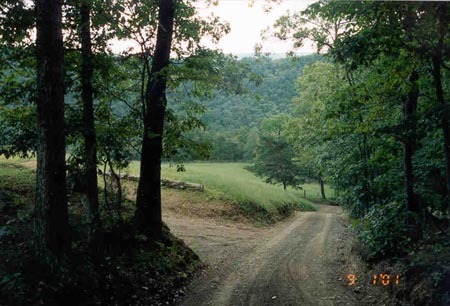 The cemetery is located about four miles north of Paw Paw, West Virginia, near the Cacapon River in Hampshire County. 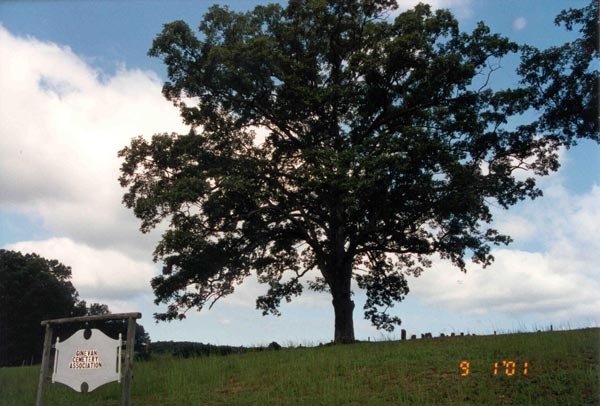 The cemetery, which is situated on a hill under two very old oak trees, is still active. The latest burial was that of Roger Ginevan which occurred in April 2000. What a contrast to see this beautiful black headstone, the front of which is covered with a large scenic picture of the mountains, only a few yards from the oldest marker, the small slate stone of Bolzar Stoker who died in 1796. 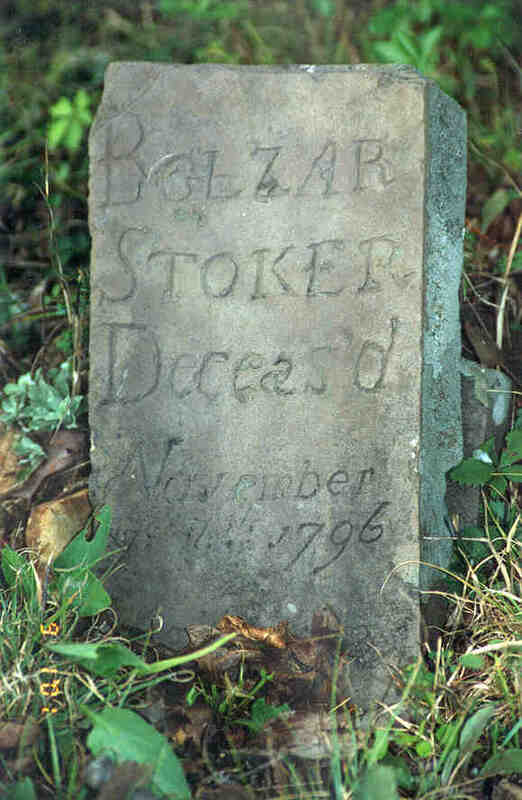 "The inscription on Stoker's gravemarker reads: 'Bolzar Stoker, Deceas'd, November ye 14, 1796, age 73 years.' 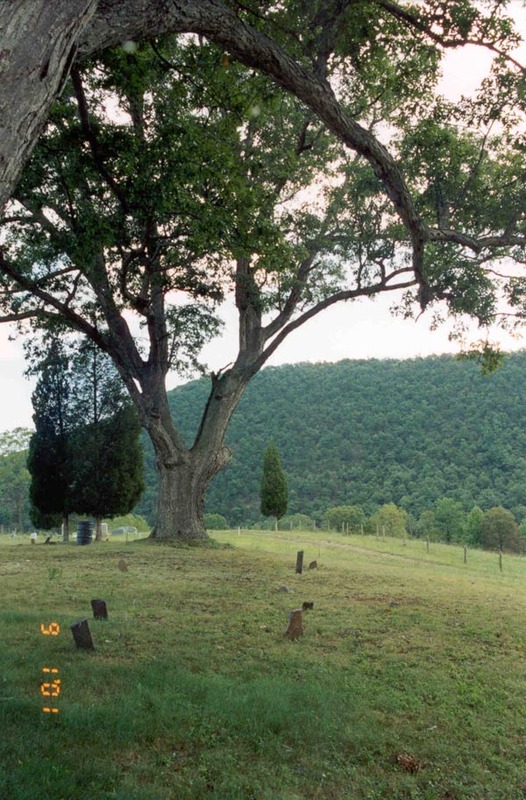 Bolzar Stoker's grave was discovered in an 18th century Stoker graveyard (now Ginevan Cemetery) located on a high hill on the west side of the Little Cacapon River. 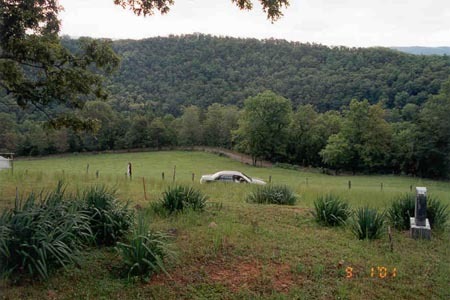 Approximately one acre was set aside for burial plots. Descendants of Mathias Ginevan still maintain the cemetery. Next to Stoker's grave is a grave designated by an uninscribed field-stone. This is believed to be the burial site of Stoker's wife, Eve Stoker. In this old section of the graveyard, there are at least 30 uninscribed grave markers made from field or river stones. These probably indicate burial places of other 18th century settlers who lived in the same region at the Stokers. Some of the earliest settlers in that area of Hampshire County were named Cox, House, Enoch, Anderson, Johnson, Critton, Fryback, Stoker, and Neill." 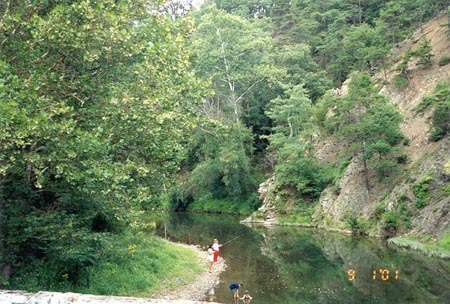 The pictures below verify Mr. Kern's information.